Hello out there…I did it! I made the move today! 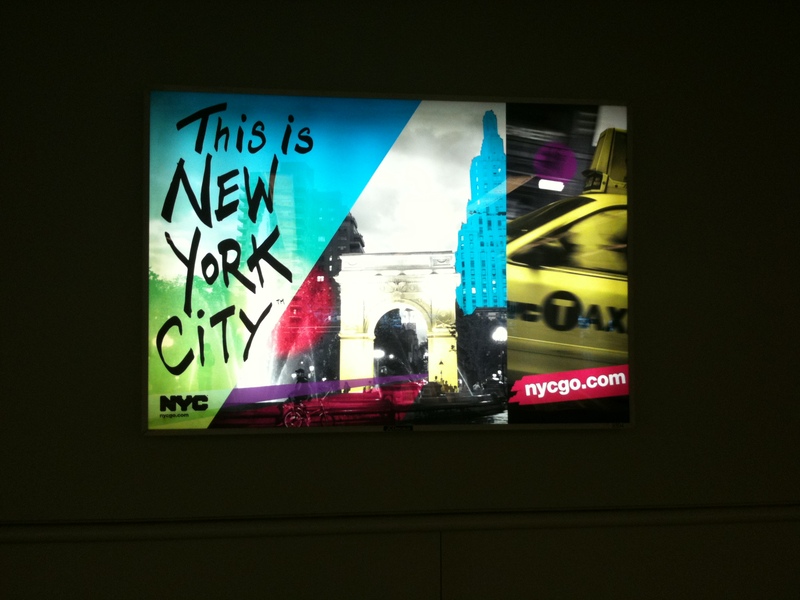 I am back in NYC after two years back home in Arkansas. Holla! It was all bittersweet, as always, with a million emotions and thoughts flooding my last several days in Jonesboro. Pros and Cons constantly coming to me, but when I arrived, all was well with the world and I somehow felt comforted being surrounded by strangers who all look different than me and hearing so many different languages being spoken around me. I explored my neighborhood where I will be for the month of October, Jackson Heights, Queens. It’s really cute-tons of stores and markets and restaurants. I already have my eye on some new hot pink rain boots (my current ones are 3yrs+ old & are beginning to split) and I bought a carton of strawberries on the street for $1. 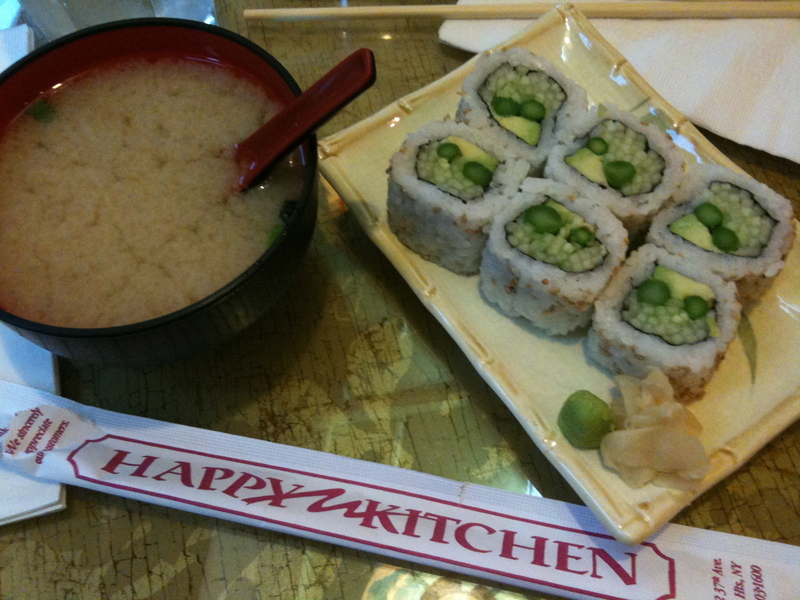 Shain and I ate at a tiny place called Happy Kitchen that served healthy Japanese dishes and sushi. I will return! Tonight I had a vegetable roll filled with cucumber, asparagus, and avocado and a miso soup. 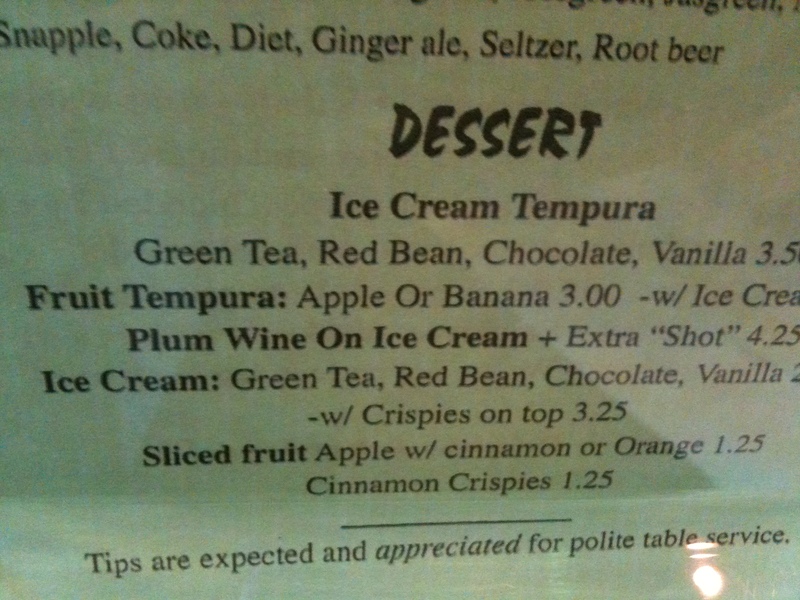 I have not tried it (yet) but on the dessert menu: Plum Wine on Ice Cream. Yes, please! Also, one of my personal favorites: Green Tea Fried Ice Cream. YUM. So good first day back in the city. 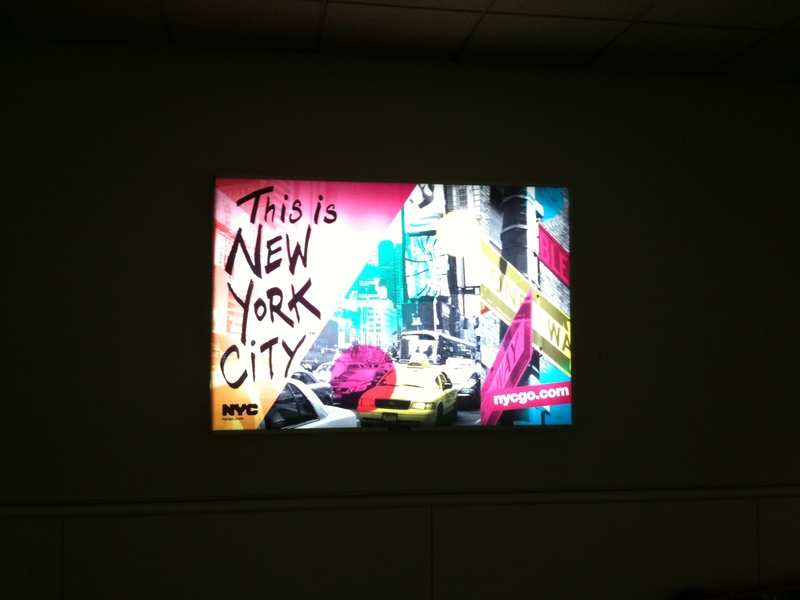 Tomorrow I’m reuniting with my BFF, Kyle, at MoMa. (The Museum of Modern Art) and there will be more daily adventures to follow. I will say briefly now (probably more in depth later) what an amazing last week I had in Jonesboro. An amazing two years, for that matter. I don’t quite know how or when I fell so deeply in love with my hometown. With all its flaws, and lack of sufficient culture, and way too many Republicans, and sometimes too many close minded people in general, I love it. I walk down the streets now, loving the trees and the stores and visiting with friends and strangers and generally feeling like “my cup runneth over” constantly. I have the most amazing clients there too. I am overjoyed in my classes while I watch all the students progress. I cannot believe how truly fulfilled I feel teaching, meaning “namaste” to the very core of my being every time I say it at the end of class. The relationships you build in a smallish town are just different than larger cities. I had clients who really enjoyed my NY classes etc, but in a town like Jonesboro, relationships are more personal. If you can embrace that, then you can thrive there and develop so many friends and meaningful partnerships. Seriously overwhelmed this week and loving life, as always. So after it “cooked” on the counter for about 9 hours, I unplugged, took out inner container and put in the refrigerator overnight. Then, in the morning, it was ready to come out and be put in individual containers! You can leave it plain or flavor it or mix it with fruit. In this particular batch, I made some with chunks of fresh peaches and honey, cherries, and my personal favorite, lavender honey. To make this yourself, get a container of dried lavender (I bought mine at Kountry Kubbard in J-Town), chop it up as fine(ly) as possible then put in a jar with honey and let it infuse. MY FAVORITE! Good luck. You can do it and it is SO worth it. By all means research how to do this without a yogurt makers, but if you wish to purchase, look it up and go for it. There are many different kinds at different prices. I got mine from King Arthur Flour Catalog for about $100. It will pay off in no time AND it’s so much less waste. P.S. Hopefully more to come when I figure out how to make yogurt soy milk!